Optimum have announced the release of two favourites from Studio Ghibli, one of the most admired and influential animation studios in the world, on Double Play packages containing both Blu-ray and DVD versions of the films: Hayao Miyazaki's glorious 1986 Laputa: Castle in the Sky and Isao Takahata's joyous 1999 My Neighbours the Yamadas. From the creators of Spirited Away comes Hayao Miyazaki's homage to Jules Verne and Jonathan Swift. Castle in the Sky was the first feature film from the now legendary Studio Ghibli and combines the Japanese master director's twin obsessions of eco-thriller and aerial escapades and turns a treasure hunt into a fight against evil for an unforgettable adventure. The little victories of the quirky Takashi Yamada and his wacky wife Matsuko, are followed in this touching animation from Isao Takahata (Grave of the Fireflies) and Studio Ghibli, the next film from the Studio's classic catalogue to arrive on blu-ray. 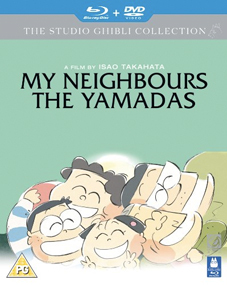 The Yamadas navigate their way through the ups and downs of work, marriage, and family life with a sharp-tongued grandmother who lives with them, a teenage son who wishes he had cooler parents, and a pesky daughter whose loud voice is unusual for someone so small. Even the family dog has issues! The English language version features the voice talents of comedic stars Jim Belushi and Molly Shannon. 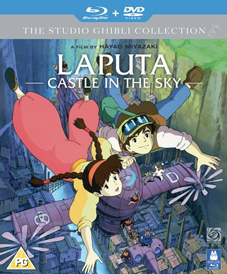 Laputa: Castle in the Sky and My Neighbours The Yamadas will be released on UK Double Play (DVD and Blu-ray) by Optimum Releasing on 9th May 2011 at the RRP of £24.99 each.